Apple iPad Air Philippines Price, Release Date, Specs : Should You Upgrade from your iPad4 with Retina Display? The Philippines will be getting the Apple iPad Air almost on the same day as the Cupertino company's key markets including the US and UK -- thanks to Kimstore, the most trusted online store in the country. 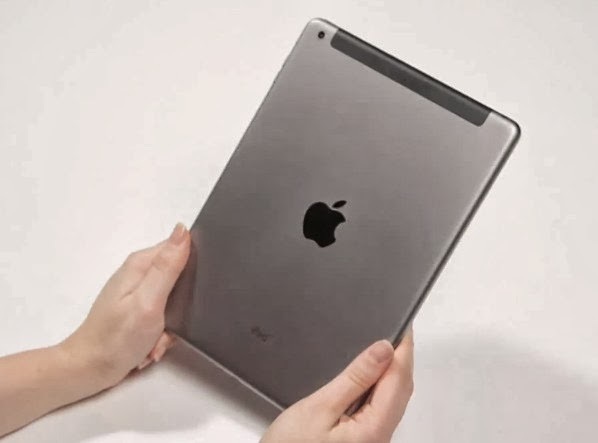 Running on a new, more powerful processor and flaunting a completely redesigned anodized aluminum shell, the fifth generation iPad is the thinnest and lightest full-sized tablet Apple has released to date. Trading the fourth generation iPad's tapered sides for an even slimmer, more feather-weight case, the Apple iPad Air is simply the larger version of the iPad Mini with Retina Display (which, with its screen turned off, looks exactly like last year's iPad Mini) -- from the design right down to the innards. Inside its shell, Apple iPad Air runs iOS 7 operating system with the all new Apple A7 processor - that also powers iPhone 5S (albeit there are reports saying iPad Air's A7 chip is slightly different from that on the new iPhone) - bringing the 64-bit desktop-class architecture to company's tablet category. This chipset makes the overall Apple slate experience faster and better than ever, from launching apps and retouching photos to playing graphic-intensive games and editing videos - previously only possible on Macs, PCs and gaming consoles - all while delivering great battery life. 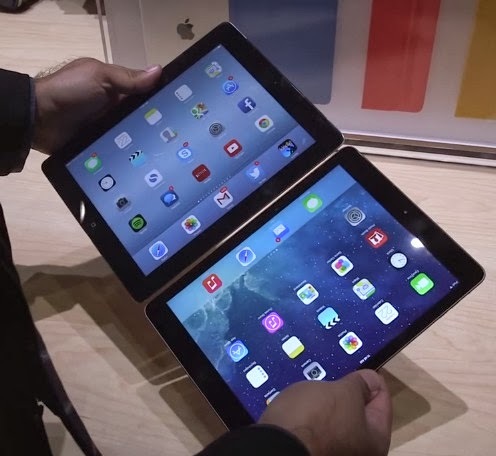 Note that last year's iPad with Retina Display merely had an Apple A6X processor. 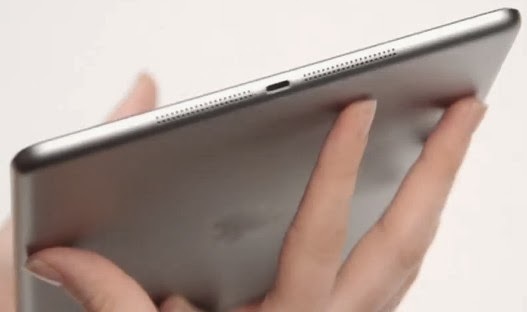 Aside from the A7 processor, the fifth-gen iPad also features the new M7 motion co-processor that gathers data from the accelerometer, gyroscope and compass to offload work from the Apple A7 chipset for improved power efficiency -- helping the tablet's built-in 32.4-watt-hour rechargeable Lithium-Polymer battery to provide a long, 10-hour uptime. The M7 motion coprocessor continuously measures your motion data, even when the device is asleep, and saves battery life for the pedometer and other apps that regularly use the accelerometer. 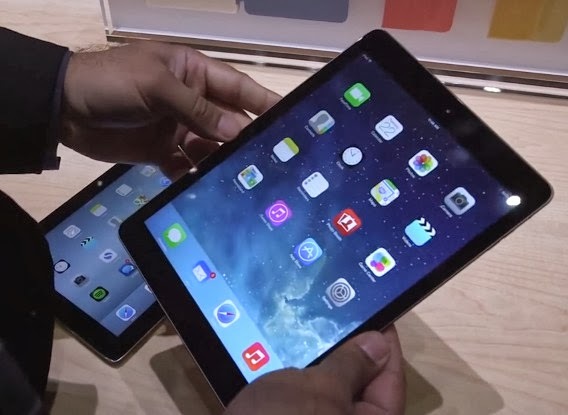 So should you upgrade to Apple iPad Air from your iPad4 or iPad with Retina Display? If you do a side-by-side comparison, you will see that the new iPad has exactly same Retina Display (same screen size, same resolution, same pixel density) and the same imaging and video recording capabilities as your current device. And if you're not really fond of playing specs-intensive games on your slate, you most likely won't even notice any significant improvement in performance on the fifth-gen release. Also, I don't think the 2012 slate will have any problems whatsoever running iOS7 and all the updated apps by Apple that comes with it. Compared to last year's iPad, the iPad Air is 1.2 millimeters thinner, 16.2 millimeters slimmer, and 183 grams lighter; The difference in thickness is not much but you'll definitely notice the difference in width and weight. In terms of technical specifications and the actual software performance, clearly, you won't find too many reasons to purchase the new release. However, if you want a lighter full-sized iPad and you don't want to be caught carrying an Apple product with an outdated design, then - by all means - upgrade to the iPad Air. TP Friends, Kimstore is now taking pre-orders for the Apple iPad Air (brand new and complete with 1 Year Apple Warranty); If you place your order today, you will get your unit on Monday, November 4, 2013. Stocks are very limited so you might want to give Kimstore a ring at +63905-320-1818, +63922-885-9799, +63908-886-9799 or (02) 904-2966 as soon as possible. Kindly check our Apple iPad Air complete technical specifications table below to see Kim's full price schedule for the slate as of today, November 2, 2013. So you'd rather wait for the official launch of iPad Air in the Philippines before making a purchase? Looking back at the extremely late sanctioned iPhone and iPad releases in Pinas for the past 3 years, it's obvious that our country is hardly one of Apple's key or priority markets for its products. Frankly, despite the fact that the Philippines is the fastest growing market for smartphones (and I'm sure for other electronic devices as well) in the whole of Asia Pacific, we're still one of the last countries to get fresh releases from the Cupertino company, which is very sad. That said, I'm personally expecting the company's official carriers to bring the slate here sometime in Q1 2014. If you're willing to wait that long, good for you.